July 27 started out as a typical Sunday for Robert Kilroy, a 56-year-old off-duty seasonal Los Angeles County lifeguard and a chiropractor. The Marina Del Rey resident went to his favorite spot in Venice Beach and was chest- deep in the ocean teaching his daughter Emily Kilroy, 15, how to surf. Suddenly, a rare bolt of lightning from an unexpected summer storm struck the beach, injuring numerous people and tragically killing one young man. The next thing Kilroy knew, he woke up in the Emergency Department at Ronald Reagan UCLA Medical Center. 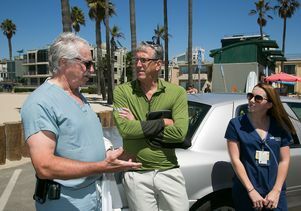 What transpired that afternoon was a series of events that led to Kilroy’s remarkable survival and the opportunity for him and his daughter to reunite Thursday on Venice Beach with the men and women who played a role in his recovery. 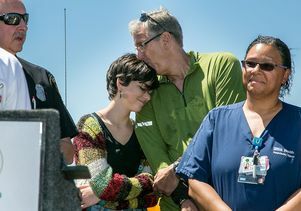 Robert Kilroy and his daughter Emily hug at a press conference, attended by Jena Lewis, a nurse and prehospital care coordinator at Reagan UCLA Medical Center, and others who cared for him. What Kilroy does not remember from that day is being electrocuted after the bolt of lightning splintered from the sand into the water. His heart stopped, he went down and his lungs filled with ocean water. Emily saw her dad floating, in full cardiac arrest. Pulling him to shore, she yelled for help. Immediately, first responders from the Los Angeles County Fire Department Lifeguards started CPR, which got his blood circulating and his heart pumping again. The Los Angeles Fire Department paramedics inserted a breathing tube and rushed him to Ronald Reagan UCLA Medical Center. “He was unconscious, but his heart was working. However, since his brain had been without oxygen, our main concern at that time was ‘Will his brain recover?’” recalled Dr. Gil Cryer, chief and director of the UCLA Trauma/Emergency Surgery and Critical program, at a press conference Thursday. Kilroy was moved to the neuro-ICU where he woke up fairly quickly and was communicating almost right away, which the team was gratified to see. Over the next few days they monitored his condition, performed procedures to help clear his lungs and kept him sedated to allow the ventilator to help him breathe and allow his lungs to recover. “Each day he kept improving, and he really made a remarkable recovery,” said Molly Steele, a nurse in the neuroscience/trauma ICU at Ronald Reagan UCLA Medical Center, who helped care for Kilroy. In additional to the Emergency Department team and the Neuro-I.C.U., Kilroy was cared for by a handful of departments at UCLA, including cardiology, critical care anesthesiology/surgical, electroencephalography, neuro-critical care medicine, nutrition, the pharmacy, and respiratory and speech therapy. Five days later, Kilroy was discharged from UCLA and has since returned to work and his normal everyday activities, including swimming in the ocean. At the press conference, he jokingly mentioned that people now ask him what it feels to be struck by lightning (he does not remember) and if he now has any superpowers (he has none). On a more serious note, he described what the experience has taught him.